Indica Marijuana is traditionally what many users are talking about when they are discussing the recreational use of cannabis. It is the poster child for cannabis in general while sativa, another strain of marijuana, is accepted as a medical herb. Although there are many different strains these two main strains are what people are speaking of when they are talking about cannabis in general. 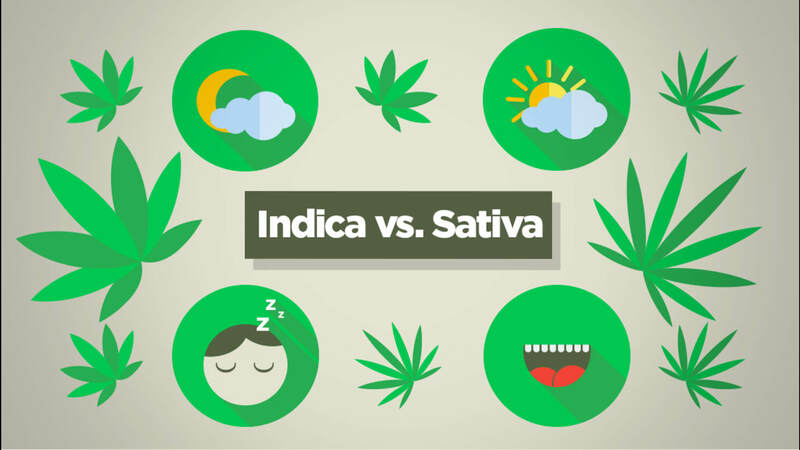 Indica and Sativa Marijuana have different effects on the user. Plants grown from Indica Marijuana Seeds are often described as a pleasant buzz; users reporting a feeling of deep relaxation. Indica Marijuana has been historically considered an effective way to obtain stress relief and a sense of calm. This calm is so intense that many users report using Indica marijuana as a way to escape from the stress of everyday life. Medically, in many other countries, Indica is used as a sleep aid and an effective pain reliever. Indica Marijuana, grown in its pure form, has also been used to treatment insomnia and aid in weight loss. So what is Indica Marijuana at its core? Classified as a desert and mountain plant, scientists believe that the plant was originally based in a wet climate. Following the evolution of the plant, scientists believe that over the decades Indica has “adapted” to dry climates. This often happens when the seeds of a plant are carried outside their natural habitat and then germinate in a new environment. The Indica Marijuana plant portrays a short and squat appearance and has densely branched large leaves and tight buds. The Indica plant can also grow to be fairly large. This is the plant type that most people see depicted on t-shirts, in ads and in campaigns to legalize marijuana in general. Non-users generally have no idea that there is more than one strain of the marijuana plant. 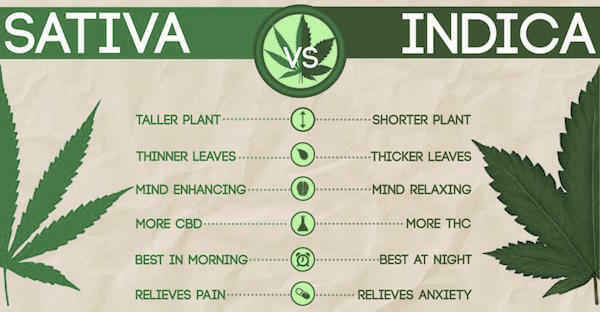 Indica has traditionally been a cultivation plant, being farmed in some areas, while Sativa is mainly grown for seeds. The Indica Marijuana plant seems to be specialized in preserving water which explains why it is easy to grow in dry regions with low humidity and rainfall. Indica plants are usually fast flowering. Indica marijuana, although generally illegal in the United States, has historically been used in other countries around the world. In the United States 29 states are just now legalizing it for medical use and some for recreational use. People around the world, however, have long acknowledged its medicinal and ritual purposes using it for everything from a sleep aid to rituals to send away a deceased loved one. The history of Indica is extensive. The plant has been traced throughout early Central Asia and, experts believe, that it may also have origins in Afghanistan. Indica is typically grown in Asia, Afghanistan, Pakistan, China and India. Today, Indica is exported and the plants are often selectively bred for different purposes. It is very important to note that plants grown from Indica Marijuana Seeds and Sativa Marijuana Seeds are not the same species. Just like tomato plants have different strains, so does cannabis. Experts used to believe that Indica and Sativa marijuana plants were the same species; however after many studies, it has been determined that they are two separate species. In fact, all cannabis plants are interbred constantly creating new variations. The Indica marijuana usually has the appearance of a small shrub. The Sativa marijuana plant is categorized as a part of the Cannabaceae family. Throughout the years this strain of marijuana has also been used around the world. Early tribes used Sativa marijuana as fiber for clothing, seed oil for health purposes, food and a recreational outlet and as a religious and spiritual tool. Spiritualists believe that when used for “opening the Spiritual pathway, sativa cannabis can clear the mind and ready the soul for communication with those who are beyond this world. Sativa is a whole purpose plant, meaning that every part of the plant can be used for some purpose. The seeds are used as feed for birds as well as people due to their protein content. The flowering of the plant is where the psychoactive chemical compounds known as cannabinoids are and are used for both personal relaxation and medical purposes. Sativa has long been used as a recreational outlet and the medicinal uses were discovered while the compound was used during spiritual ceremonies. Users of sativa can prepare it to be used in smoking out of your new bong or using your dry herb vaporizer as well as oral ingestion. Learn how how people smoke their marijuana in the 21st century. Sativa Marijuana Seeds produce plants that are generally taller. Its leaves are narrow and serrated giving it loose spear-like flower clusters. The Sativa marijuana plant is not as strong psychoactively as Indica marijuana seeds. The ratios of CBD:THC can be up to 4 times higher in the Indica plant. Users of the sativa plant report less anxiety and experts believe that this be because the CBD’s antagonist effects at the cannabinoid receptor level is less. Sativa marijuana causes a “cerebral high” which users enjoy when combating pain and depression. Sativa marijuana is often used for medical use and does not induce a sedative affect. This particular strain of marijuana is often used by people who need to fully function during the daytime. Sativa effects the emotions making it the perfect medicinal plant to treat the psychological aspects of illnesses. Smoked some indica and about 2 hours later I’m ready for bed. Indica is known to put people to sleep. In fact, that is one of the most common sought effect of cannabis use. Many people use marijuana to treat their insomnia and sleep apnea. If you know what species the plants are (sativa or indica) then you can chop them down at 8-9 weeks for indica or 12-13 weeks for sativa. Best time to harvest. 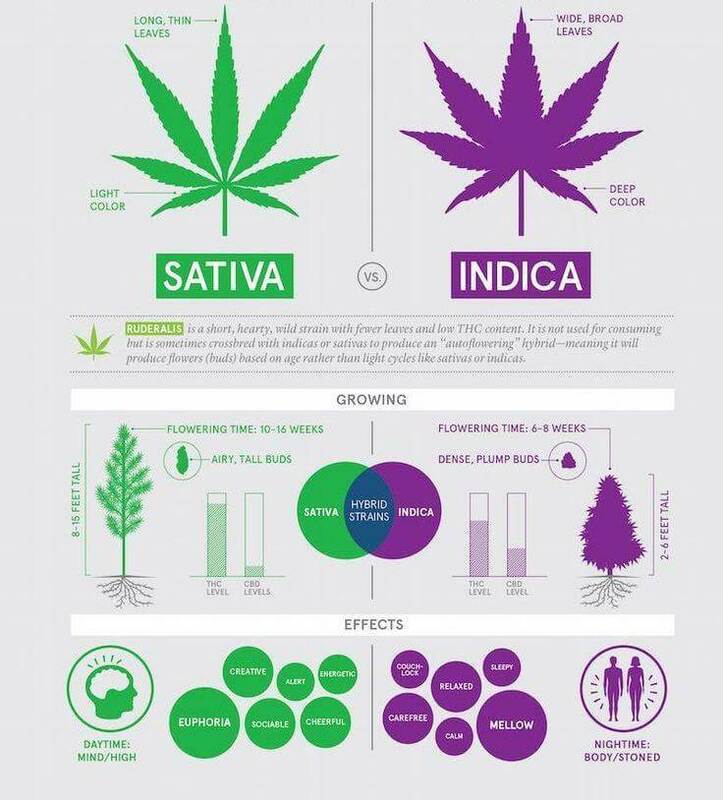 Like you said, Sativa is known to flower later than Indica plants. They can take up to 12 or 13 weeks before it starts flowering. Overall Sativa takes longer to mature. Just remember your cannabis plants should flower relatively at the same time if they were germinated together. If you want to have a quick grow you should start with Indica first as that will be the shortest wait to harvest. You can expect your flowers to at least double in size during flowering. 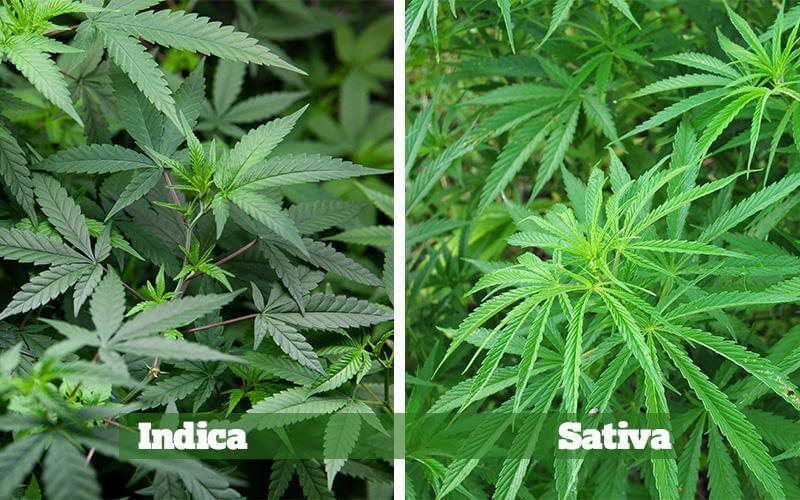 Sativa plants generally grow a lot taller than indica plant strains. I grew some Thai Haze earlier this year, she started flowering when she was about 18" and by the time she had finished her main cola was up to my chin. Thai Haze is quite a nice strain. However, this strain requires growing experience because it can be temperamental. Thai Haze is known to grow up to six feet tall and to give off a spicy and skuny aroma that almost everyone should be able to recognize. I remember it tastes super earthy with a little hint of sweetness. Not bad at all. I have post herpetic neuralgia from a serious case of shingles when I was in my 40’s. Post herpetic neuralgia happens after the nerves are damaged and it’s a large source of very serious pain. I find that smoking Indica bud with good levels of CBD works best for me. Everyone is different! It took me awhile to figure this out after many tests. I have gone from using a lot of serious pain medications to using very little to treat pain. If your goal is to get off all pain meds, then this is an excellent piece on the different types of cannabis you can experiment with. Pain, both physical and emotional, can be effectively controlled with cannabis CBD or THC oil. It has been used in many cultures and societies for medicinal use for treating pain. Indica marijuana grows naturally with high amounts of CBD and many patients have found this the best strain for their pain and anxiety. It's been shown CBD contains many of the medicinal and healing benefits in cannabis so I am glad to hear you have taken the time to experiment and find the right medicinal strain for you. I too agree that cannabis is best when you have CBD and THC in the strain together. I feel better from using a high THC Indica bud or tincture and it helps me sleep which helps my body heal at night. I also have Fibromyalgia and this plant has been remarkable in keeping my pain at bay, it really does help a lot. It isn’t a cure all but it most certainly has been very effective in reducing the pain levels. I don’t really like sativa (except for blue dream) because it can make me feel anxious. Having a very painful condition will oftentimes bring on anxiety and I tend to be much better with less anxiety. CBD, along with the THC, if very important for the medicinal properties of cannabis. There are people who rely only on CBD concentrate oil for their medication because they either do not like the psychoactive euphoria produced by THC or they are in a situation where they cannot be intoxicated (for example a cab driver). CBD contains many important medicinal effects, and especially shows signs of anxiety relieving properties. Many studies show CBD, along with THC, is an active compound in cannabis that has medicinal properties. It sounds like you have tried multiple strains and finally found the right medication for your Fibromyalgia. Keep the pain away, keep smoking the buds, and keep living a healthy and pain free life! 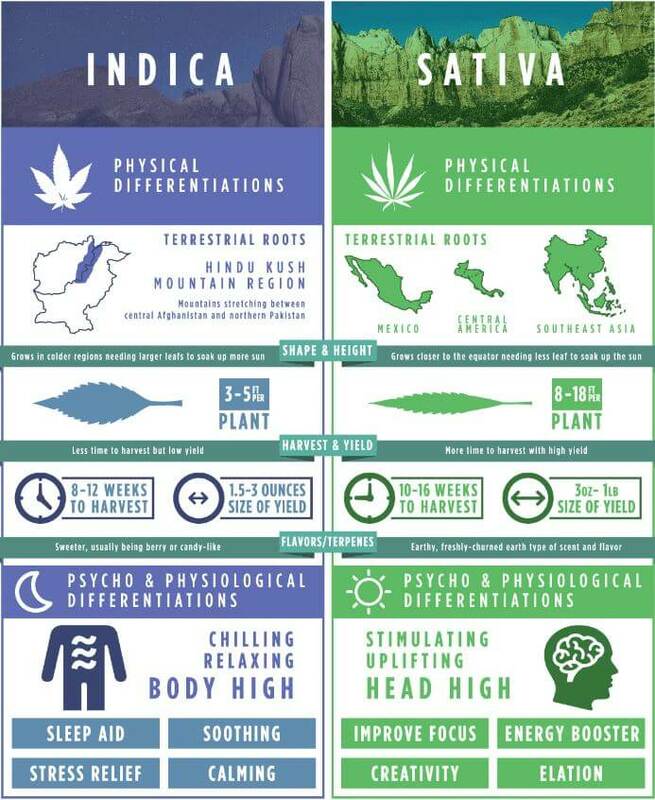 Sativa tends to do better closer to the equator. And all of them have to be grown outdoors because of how big they can get. This may be a challenge depending on where you live. You need to check your state laws. Indica strains can be grown indoors just about anywhere because they do not get so tall. Choosing the right strain is always important before growing any cannabis. After you have checked with your state laws you can decide what strain of cannabis you would like to grow. Like you said, sativa tends to grow in warmer climates and this strain can grow as high as 20 feet! Weed is amazing. It makes everything better and more adults should use it recreationally. I start my day out with a berry, pineapple smoothie and some strong sativa with coffee in the morning. By noon it’s time for some hybrid buds for weight training. This really helps trigger that mind/body connection. I finish up with indica for dinner. Sure, I may be half lit all day, but it quells my homicidal rage. Sometimes having a set of daily rituals is best. Medicinal use is part of my routine as well, though not intricate as yours.